The Neptune bath range offers a huge choice of sturdy and rigid steel baths. The simple, clean lines of this collection make it blend seamlessly with any bathroom decor. 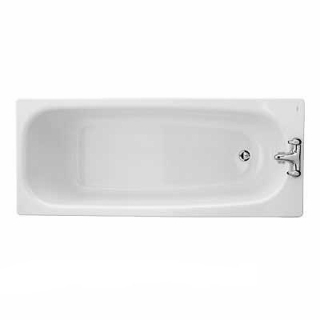 All baths within the Neptune collection are standard rectangular shaped and are made from 2.3mm standard gauge steel. Selected Neptune models offer a slip resistant standing area, ideal for family homes or for the elderly. This stylish collection offers both 2 and 0 tap hole baths. Browse our range of deck mounted bath fillers and bath shower mixers to complement the 2 tap hole models, or alternatively a traditional set of bath pillar taps would also be suitable. For 0 tap hole baths, why not try a contemporary wall mounted tap set or a bath spout. The Neptune range offers dedicated Neptune front and end bath panels. Selected Neptune baths feature hand grips for added safety. With a 25 year manufacturers warranty, the Twyford Neptune range offers reliability and is a great choice for any bathroom.